Cycling '74 has recently given us some really nice updates such as the Mira update and the MPE & Blocks implementation. This is my project that implements the updates. 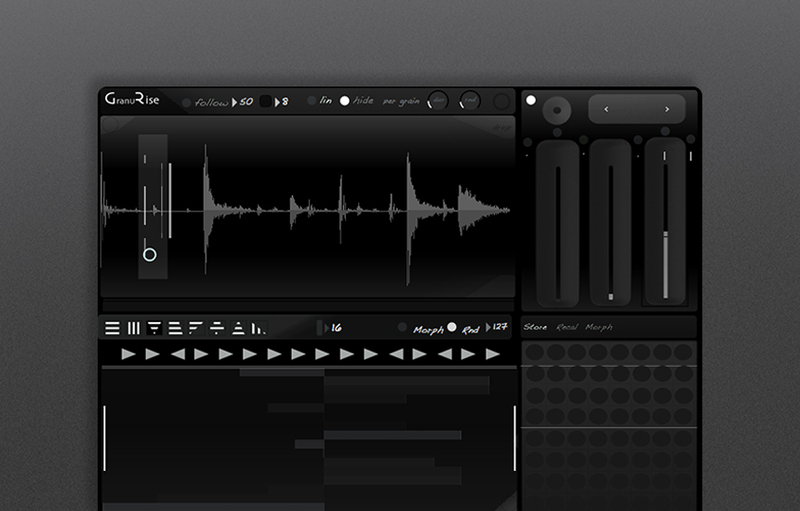 Granurise is a real-time Looper, Sampler and Granular synth which integrates with the outside world trough Ipad Mira, Midi–MPE & OSC. Great project. Will it be released as a free or premium tool? Thanks for your feedback, the project is still in alpha stage and it will be released. I'm currently in discussing with a company and a institution if they will support it financially in this case it will be most likely free. If I will have to put it out as my own project than the only option for me is to get something from it, since I have spent a lot of time developing it, but it’s not gonna cost much. Anyway if you like to be informed about the project please send me an email to granurise@gmail.com and I will keep you updated. sounds and looks fantastic, great work! looking forward to the release. Love it, looking forward for it to be released! Great work Andrej! The sound is all from the granrise or maybe it's processed? Anyway really a great work! Now read at the end of the video that the sound is all from granrise, really cool stuff! Maybe there's something like a random filtering going on ? Thanks to you and Grant. Great video! It would be great to have a look at the patch!!! It's all done in max/msp? THX, yes it's all done in Max MSP. Can you explain how you show waveform in mira, maybe with multislider? and how filter section works? it's a highpass? sorry for all the questions but i'm really impressed by your work! Yes the waveform is displayed with a multislider. In the filter section there is a lowpass filter going on per each voice and this can be (range) randomized so you get sort of morphing filter effect that in conjunction with other controls per voice like pitch, vol, pan... can achieve some interesting sonorities. Don't worry about your questions, it's not a problem and thanks again for the feedback. Wow, impressive work!! I'm really looking forward for the release, congratulations!!! Hi Andrej nice work again ,can i ask you how you feel in terms of workflow with the blocks?And if it works fine in max for live environment also if you know, Thanks a lot. Would be very nice to see it in M4L format as well. Observer: Sorry for the delay, I have been really busy lately. Thanks for your comment. I really like how Blocks integrates in to Max it's kind a simple Mira like integration. I haven't tasted the Blocks Live integration jet, but I will definitely test it shortly. Thanks, now I'm in a last stage of defining and testing the patch. So it will be released soon. First thanks for your interest in the GranuRise project. I'm terribly sorry because is taking it this long. In this year I have been involved in so many project that became hard for me to handle them all. Anyway I have also constantly developed and optimised the GranuRise project and I have added some really nice features. Currently I'm working on the last usability details & tutorials and I'm finishing the M4L integration. So far I'm really satisfied with how the patch is progressing and to be honest, I also can wait to release it and see what others can do with it. Thanks so much for your patience. Thanks Robin for your understanding and suggestion I will definitely consider it. Forgot to mention in the previous post I will definitely keep you updated.